Hometown: Trenton, NJ/Beach Haven, Long Beach Island, NJ. 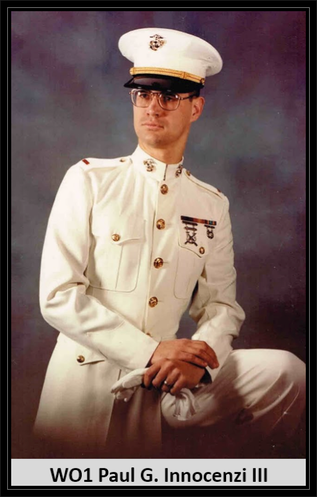 WO1 Paul G Innocenzi III was born and raised in Trenton, New Jersey. He graduated from St. Anthony's High School before entering into the Corps. He was born on Veteran's Day..11/11/55....his brother Mark brought his body back from Dover on 11/11/83. Gold Star Father Paul G. Innocenzi, Jr.
​ Paul G. Innocenzi, Jr, 83, of Beach Haven entered into God's loving care on Monday, June 27, 2016 at home in Beach Heaven surrounded by his loving family. Born in Trenton, he was a lifelong area resident before moving to Long Beach Island 14 years ago. Paul served in the Army during the Korean War. He was employed by Trenton Public School System as Chief of Security retiring in 1990. Paul was a member of the American Legion and was part of a Goldstar Family. He loved to spend time with his family especially his grandchildren. Predeceased by his parents, Paul G. Sr. and Anna (Zupko) Innocenzi; his beloved son, Chief Warrant Officer Paul G. Innocenzi III; and a brother Robert Innocenzi; he is survived by two sons, Mark J. Innocenzi and husband Joseph Brancato, and Scott F. Innocenzi and wife Kathleen; one sister Doris Short; a daughter-in-law Deborah Innocenzi; five grandchildren, Paul IV, Kristen, Megan, Brian and Kevin; three great grandchildren, Paul V , Michael, Brooke and companion Peggy Immordino. A Mass of Christian burial will be held 11 a.m. on Friday, July 1 at St. Anthony Church, 626 South Olden Avenue, Hamilton, Entombment will follow in St. Mary's Cemetery, Hamilton. Calling hours will be Friday, July 1, from 9 to 11 a.m., at the church. There will be no calling hours at the funeral home. In lieu of flowers, memorial contributions in Paul's memory may be made to NJ Run for the Fallen, 27 Evergreen Drive, Browns Mills, NJ 08015 or the charity of your choice . Please visit Paul's tribute page @ www.derricofuneralhome.com Published in The Trentonian on June 29, 2016.